On the holiest of Jewish holidays, Yom Kippur, in the autumn of 1931, Guy de Rothschild walked through the massive street gate at 19 Rue Laffitte, for the first time as an adult on adult business. The day was chosen carefully, what others might perceive as the beginning of a banking career, to a Rothschild it was entering into a priesthood. At twenty-two, Guy was assigned letters to write. One of his correspondents was a Cardinal Pacelli, future Pope PiusXII, then in charge of Holy office finances, and who kept a small account at MM. de Rothschild Freres. In the book, Hitler’s Pope, John Cornwall’s chronicles the life of Eugenio Pacelli, Pope Pius XII. Pacellli was arguably the most dangerous churchman in modern history. As Pontiff during World War II, not only did he fail to speak out against Hitler’s Final Solution, but he personally made the Final Solution possible! In the first decade of the twentieth century, Pacelli was a brilliant Vatican lawyer who helped shape a new ideology of unprecedented papal power. 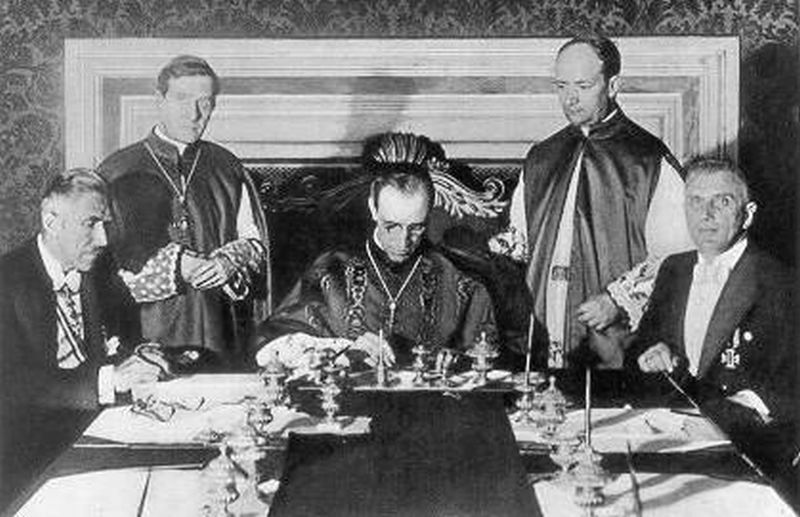 As papal nuncio in Munich and Berlin in the 1920’s, he used cunning and moral blackmail to impose Rome’s power on Germany. In 1933, he negotiated a treaty with Hitler, the Reich Concordat, which ensured that the Nazis would rise unopposed by the most powerful Catholic community in the world- sealing, by Hitler’s own admission, the fate of the Jews in Europe. 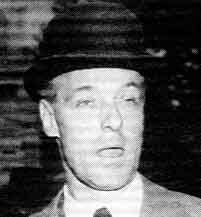 How could Eugenio Pacelli possibly have gotten away with such cunning, especially since we know that he was in personal contact with the Rothschilds. Guy de Rothschild was his pen pal eight years before he became Pope. But wait… if Pacelli was Hitler’s Pope, and Hitler was a Rothschild… then he was Rothschild’s Pope! How did Eugenio Pacelli become Rothschild’s Pope? Eugenio Pacelli was described routinely, during his pontificate and after his death, as a member of the Black Nobility. The Black Nobility were a small group of aristocratic families of Rome who had stood by the popes following the seizure of their dominions in the bitter struggle for the creation of the nation-state of Italy… Pacelli’s father and grandfather before him owed their distinction to membership of the caste of lay Vatican lawyers in the service of the papacy. Pacelli’s immediate family association with the Holy See dates from 1819, when his grandfather, Marcantonio Pacelli, arrived in the Eternal City to study canon law, or Church law, as a protoge of a clerical uncle, Monsiignor Prospero Caterini. By 1834 Marcantonio had become an advocate in the Tribunall of the Sacred Rota, an ecclesiastical court involved in such activities as marriage annulments. While raising ten children (his second child being Eugenio’s father, Filippo, born in 1837), Marcantonio became a key official in the service of Pius IX, popularly known as Pio Nono. The quick tempered, charismatic, and epileptic Pio Nono (Giovanni Maria Mastai-Ferretti), crowned in 1846, was convinced, as had been his predecessors from time immemorial, that the papal territories forming the midriff of the Italian peninsula ensured the independence of the successors to St. Peter. If the Supreme Pontiff were a mere inhabitant of a “foreign” country, how could he claim to befree of local influence? Three years after his coronation, it looked as if Pio Nono had ignominiously lost his sovereignty over the Eternal City to a republican mob. On November 15, 1849, Count Pelligrino Rossi, a lay government minister of the papal states, famous for his biting sarcasm, approached the Palazzo della Cancellleria in Rome and greeted a sullen waiting crowd with a contemptuous smile. As he was about to enter the building, a man leapt forward and stabbed him fatally in the neck. The next day, the Pope’s Quirinal summer palace above the city was sacked,, and Pio Nono, disguised in a priest’s simple cassock and a pair of large spectacles, fled to the seaside fortress of Gaeta within the safety of the neighboring kingdom of Naples. He took with him Marcantonio Pacelli as his legal and political adviser. From this fastness, Pio Nono hurled denunciations against the “outrageous treason of democracy” and threatened prospective voters with excommunication. Only with the help of French bayonets, and a loan from the Rothschild’s, did Pio Nono contrive to return to the Vatican a year later to resume a despised reign over the city of Rome and what was left of the papal territories. From this we definitely see that the Vatican owed it’s existence to the Rothschild’s from this point on. Canonization is the process of making someone into a saint and involves proving that a candidate has lived in such a way that he or she is worthy of sainthood. It is currently practiced by the Roman Catholic Church and its appendages, by the Eastern Orthodox Church, and by the Oriental Orthodox Churches. Eugenio Pacelli is being considered for canonization. Indeed, in the first decade of the twentieth century, Pacelli, the brilliant Vatican lawyer helped shape a new ideology of unprecedented papal power. And as papal nuncio in Munich and Berlin in the 1920’s, he used cunning and moral blackmail to impose Rome’s power on Germany. But was there something more going on between Pacelli and Hitler’s lawyers in 1933, when the Reich Concordat negotiations were going on? Did the Concordat negotiations provide Pacelli with a cover to aid Hitler’s lawyers with handling Germany’s Jews. After all the Vatican had centuries of “legal” experience and had cultivated an unsurpassed expertise in dealing with Jews. Did Pacelli and Vatican lawyers share this valuable legal knowledge with Hitler’s legal eagles? They had the knowledge. The Concordat negotiations provided them with a flawless cover. They had opportunity. Time table below, found in Raul Hilberg’s The Destruction of the European Jews compares the basic anti-Jewish measures of the Catholic Church and the counterpart measures enacted by the Nazi regime. Is Pacelli worthy of sainthood? You decide. Jews not allowed to employ Christian servants or possess Christian slaves, 3rd Synod of Orleans, 538. Jews not permitted to show themselves in the streets during Passion Week, 3rd Synod of Orleans, 538. Vice-Chancellor Franz von Papen is sitting on his right. Did this group secretly formulate the Nazi anti- Jewish measures that were foisted upon Germany’s Jews months later? Hitler in July 1933. That month he declared that his negotiations with Pacelli had created “an aura of trust.. .in the developing struggle against international Jewry” Of course both Pacelli and Hitler, both associated with the Rothschilds, were agents directly involved with promoting the agenda of the Sabbatean-Frankist Illuminati. Eugene Pacelli on his coronation day, Marcli 12, 1939, on the eve of World War II. Pacelli, as Pope Pius XII, broadcasts to the world with Giovanni Montini, the future Pope Paul VI, at his left shoulder. His 1942 Christmas Eve broadcast trivialized and denied the Nazi Final Solution. written by an orthodox rabbi which praises Eugenio Pacelli’s treatment of the Jews during World War II.